A newspaper article published by The Oviedo Outlook on May 26, 1977. 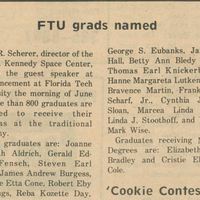 The article lists the local graduates of Florida Technological University (present-day University of Central Florida) during the spring semester of 1977. Lee R. Scherer, Director of the John F. Kennedy Space Center, was the guest speaker at the commencement ceremony to be held on June 10. Florida Technological University (FTU) was founded by the Florida Legislature in 1963 and opened in 1968. The intended goal of the university was to train personnel to support the U.S. space program at the John F. Kennedy Space Center and Cape Canaveral Air Force Station. In 1978, Reubin Askew renamed FTU the University of Central Florida (UCF). By 2014, enrollment preacher over 60,000 students. While the main campus is located at 4000 Central Florida Boulevard in Orlando, there are also 12 satellite campuses. 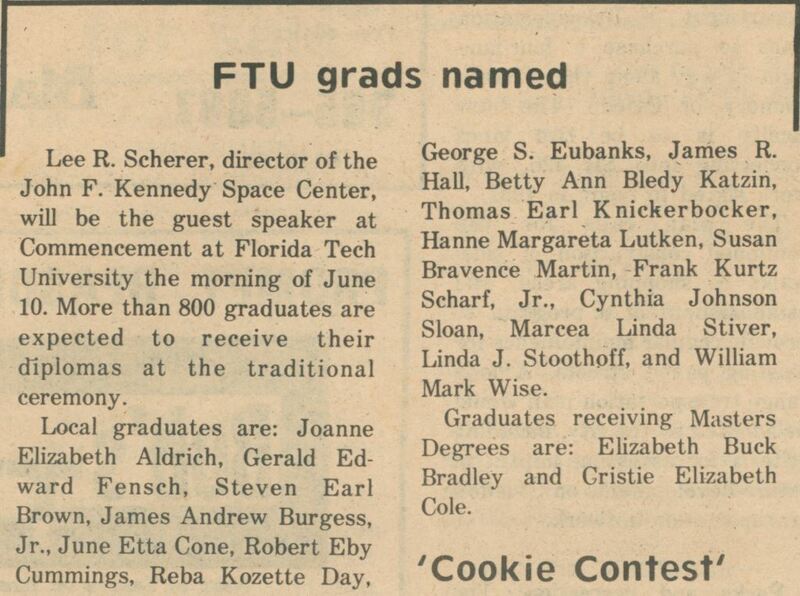 Original newspaper article: "FTU Grads Named." The Oviedo Outlook, Vol. 4, No. 40, May 26, 1977, page 3: Oviedo Historical Society, Oviedo, Florida. Digital reproduction of original newspaper article: "FTU Grads Named." The Oviedo Outlook, Vol. 4, No. 40, May 26, 1977, page 3. "A History of Central Florida, Episode 45: Diploma Plate." RICHES of Central Florida. https://richesmi.cah.ucf.edu/omeka2/items/show/5523. “FTU Grads Named.” RICHES of Central Florida accessed April 18, 2019, https://richesmi.cah.ucf.edu/omeka/items/show/5672.